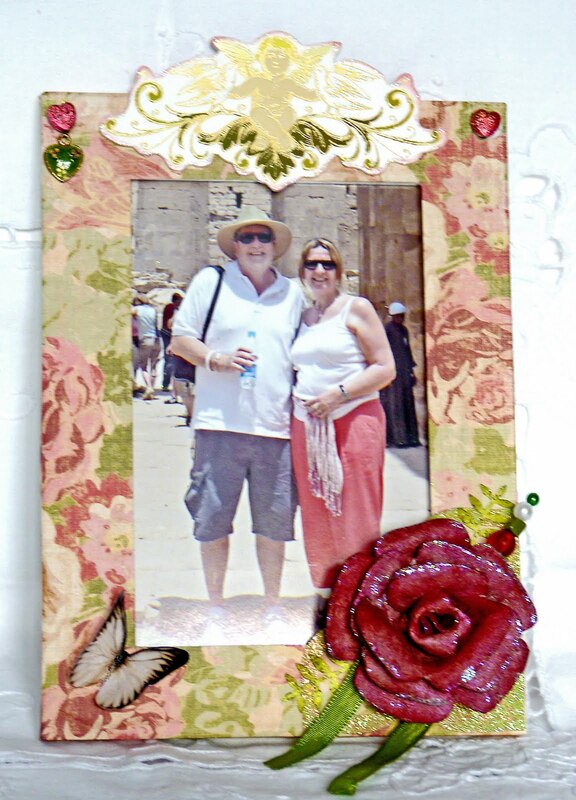 I thought I would show you another photo frame I have altered. This time it is more of a shabby Chic style. It really tells it's own story, but the thing I am most pleased with is the lovely red grungepaper flower. I used the TH tattered floral die and added some glitter to the edges and love the result. The die cut used at the top is from the Llewelyn Bowen Renaissance collection and as you can see I have also added a pin and beads and some little hearts, one with a green heart charm hanging from it. Of course I have added a butterfly from my downloaded collection and spread glossy accents over it. Flutterby Wednesday - Open but with a butterfly, fairy or angel added. ABC Challenge - You and Me This is Ken and I on holiday in Egypt earlier in the year. Lovely memories. Oh how pretty!! Fabulous job! Thanks for playing along with my flutter by challenge! Hi Brenda what a fabulous job you have done with this frame it looks absolutely gorgeous. Hi Brenda, this is gorgeous, I so love the idea. Beautiful! The flower is gorgeous - the frame FABulous! Gorgeous frame and thanks for sharing it with Belli challenge link this week. Oh gorgeous frame Brenda, love that rose. beautiful frame! the rose is divine! thanks for playing along with us at the Shoe! What a gorgeous frame Brenda! I love the glittery flower!! Thanks so much for joining us at The Creative Cottage! Brenda, this is such a beautiful frame...NOW! Great job! thanks for joining us in the Belli Challenge! Such a gorgeous frame and the photo is beautiful. Thanks for joining us at Pile It On! Thank you for joining us at "PIO" this week! Super pretty frame. I'd love to have this sitting on my desk. Fabulous grunge paper flower. I did so want that TH die until I found out it wouldn't work with my Cuttelbug - wahhh!!! So happy you could join in the fun with the challenges this week at Fairy Fun Friday and Creative Card Crew! Beautiful frame!!! Love the embellishments you added! Thank you for joining us in the Belli Challenge!